Growing up, Eli Iserbyt (pronounced Ell-ee Eez-er-beet) had dreams of playing football. He played the sport, was talented, and believed that was his future. Those dreams faded once he started watching cyclocross on television. From that point forward, all he wanted to do was race his bike. Not on the road, or the velodrome, but in the fields, through the mud, on a cyclocross bike. 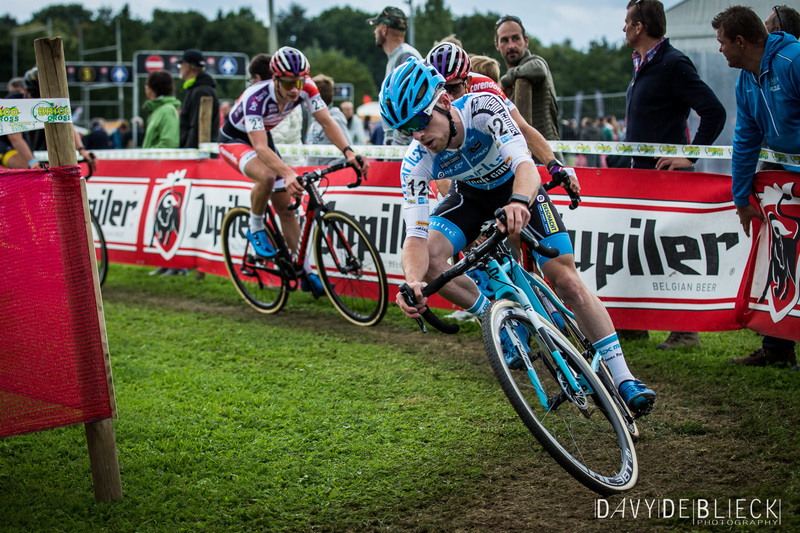 With football all but forgotten, cyclocross was the new dream. And success in that sport quickly became a reality. From Bavikhove in West Flanders, Belgium, Eli wasted no time proving he was a talented rider, winning his first races at age 12. In 2011, at age 14, he won his first Belgian national championships in cyclocross and mountain biking. Since that time, Eli has won five Belgian cyclocross national championships and one European Championship jersey. He also won the U23 World Championship in 2016, his first year in the category. We caught up with Eli before he left for the United States and his first racing experience in North America. Eli, along with the rest of his Marlux-Napoleon Games teammates are currently in Iowa City, Iowa, preparing for Jingle Cross, the first World Cup event of the 2017-2018 season. What drew you to cyclocross over road racing or some other discipline? It was watching the pros on television that got me on the bike and to do what I do now. When I was watching the races on television I just wanted to do what they were doing. Road racing was not something I wanted to do, growing up. Now it’s something that’s really important for stamina, but I originally started just doing cyclocross. What is it about cyclocross that appealed to you? Most of all it’s the technical aspect. You can make up time or lose time in the corners. You have to choose which tires to use and at what tire pressure. It’s all of the details. Also, it’s an attractive sport. It’s one hour, full gas. That’s what I like the most. In cyclocross, when you’re strong most of the time, the strongest guy will win, but in road racing there are guys who maybe aren’t that strong but they can use another in the race to help finish higher in the results. I really like that cyclocross is individual and all of the little details around the sport are important. This is your second year on the Marlux-Napoleon Games team. What’s your experience so far? I’m one of the youngest on the team, so when I first moved over it was hard to find my way. But Marlux is a team that is located really close to my home. In Belgium there are several dialects. If you’re more towards Antwerp or Germany, the people speak a different way. When I moved to Marlux, I knew everybody and we spoke the same language, if you want to call it that. It’s easier now that I’ve gotten some good results and the training is very good. And having Mario DeClerq and Danny De Bie, high class pros from the past, to work with is really important for me. What’s the biggest change you’ve seen moving from Telenet-Fidea to Marlux-Napoleon Games? At Marlux, I now have the support of the other riders in the race. So if I’m in the front with Kevin [Pauwels] or Michael [Vanthourenhout], we will race for one another. So it’s more the team that is superior to the individual. Of course, everyone wants to win, but when we see an opportunity to do something for another rider on the team, then we will do it. For me, that was not the case at Telenet, so that really showed me some more aspects of cyclocross. We use different tactics because of Mario DeClerq’s involvement with the team. When he was racing, people knew him because of his tactics and the little things he did during the race. And that’s more the case with Marlux. They think about how to win a race. Because now it’s really hard! With Wout van Aert and Mathieu van der Poel in the race, you really have to be into the little details. The team is doing that and it really intrigued me. I didn’t do that before. And it’s not just before the race but also after the race. They analyze how things went and that really suits me. What types of conditions and terrain are your favorite for racing? For me, I like when it’s wet but not too muddy. So not deep mud but say two or three centimeters of mud. It’s slippery, but not really so wet that it’s a running course. I don’t want that. I’m only 1.65 meters [racing weight 55 or 56 kgs], so not really that tall. But a technical course that’s a little bit wet with some explosive parts out of the corners or a little bit uphill, that’s really my kind of stuff. Was it difficult transitioning from the juniors to the U23 category? Also, Mathieu van der Poel and Wout van Aert left the U23 category, so there was a little bit of a gap that had to be filled in and I was in the right place at the right time to fill that gap. Your 2016 World Championship win had one of the most memorable moments when Adam Toupalik thought he had won and celebrated a lap early. When you see that, how does it affect you? Does it take you out of the race at all? At the moment [when Toupalik sprinted for the line a lap early], I had all of the emotions possible. Up to that point, the race had gone really bad. After the first and second lap I was not getting into my rhythm and nothing was going good. But as the race went on I started believing in it. I already thought I had lost the race when Adam though he’d won, so I was not so emotional. After the bad start, I was already thinking I had no chance. All of the emotions already happened. At that moment near the end, I saw an opportunity and I started really again believing in it. I really wasn’t looking at Adam because I knew the finish was still a lap away. In normal races I would stress out if somebody rode away from me like that. But at that moment because the first laps didn’t go well I thought I already lost so I stayed really calm. And even now I wonder how I did this. It was a big opportunity to win a title the first year in the U23s. Only the real legends in cyclocross have done that, so for me it was a very special moment. What advice have people given you about coming to the U.S.? The one thing I’m concerned about, that I asked for advice, is the jet lag. I’ve never been to the U.S., so I don’t know how we have to train when we are there or what to expect from the jetlag, so that’s all new for me. I think the team wants to be as fresh at the start as possible so we are looking into those details to really get into good shape at the start of the race. That’s really important. Jingle Cross is the first World Cup. What have you heard about that event and the track? I saw the race last year at like six in the morning, here. I got out of bed to watch it. I think the track itself, it has everything. The uphill, the running parts, the descent. Last year there was some mud. I don’t know what the weather will be this year but I think the circumstances, like last year, will really suit me. The uphill parts fit my capabilities. They are not that long but you have to stay always on the pedals. It’s an intriguing track. I hope the weather will be not that good because then you have a real cyclocross like you’d find in Belgium. The race is a real cyclocross track. How does lining up with the elite field in the U.S. World Cups change your goals? It gives me a more comfortable feeling because it’s the beginning of the season and if you’re not that good, it’s not that bad because I’ll do the other World Cup races with the U23s. It’s an opportunity for me to show what I’m capable of. I think I’m in really good shape at the moment. Not the best shape, but I think I can be closer to the riders who are not that good in the beginning of the season. I’ll be focused at the start but not that stressed out because it’s not my category and I have some time to learn. I’m only 19, so they don’t expect much from me and I think those are the races I really excel in. Are you racing the Friday night C1 at Jingle Cross? If everything goes well, then I want to compete. But if I’m not 100 percent fresh or there is something with the jet lag or we couldn’t train that good or there isn’t enough rest then maybe I won’t do it. But the plan is that I will start. What does your offseason look like? That’s the most tricky part for us. We end mid-February and I always take four weeks of rest, doing nothing with a bike. We go to training camp in April and then in May we start doing road races. May through August are really focused on the road racing and doing stage races like the Tour of Slovakia and the Tour of Belgium … three or four stage races and also some kermesses to keep the high intensity. In August, there is a little rest period and then at the end of August we do a training camp with the team. That’s roughly the off-season. It’s really hard work with lots of racing but I think we need that to be in good shape for cyclocross season. What have you heard about U.S. spectators? I heard they are really open to cheering for everybody and they support everybody. That’s a whole different thing than in Belgium. I think that will be a shock for me because in Belgium the fans are really divided and rooting for their teams or Mathieu and Wout and maybe against Klaus and Kevin. It’s really like football, here. You have different sides. The American crowd is really supporting everybody and that’s really good. And it’s a good point to go further in cyclocross in America. When the first three pass here in Belgium, then everybody’s quiet and they’re just watching the screen to follow the first riders in the race. In America everyone will feel like they are important and I think that’s special. What’s your average tire pressure in a race? There’s always a difference between the Dugast tires and the Challenge tires. I ride the Challenge tires and you always have to go .2 bar more than the Dugast. That’s really important. From there, if it’s really dry I’m doing 1.4 bar [20.3 psi] or 1.5 bar [21.7 psi]. That’s really fast. When it’s the track I like the most, so a little bit wet but not real mud, then it’s 1.1 bar [15.9 psi] to 1.2 bar [17.4 psi]. And when it’s really really muddy I go to 0.9 bar [13.0 psi] to 1.0 bar [14.5 psi]. That’s really really low but that’s where you get the most grip from your tires and when your tires are really doing what they are supposed to do. I use Challenge tires and the ones I find special are the Baby Limus. Dugast doesn’t have a tire that is similar to it. They have the Small Bird, but when you ride in wet conditions the dirt gets packed into the grooves. With the Baby Limus, you have the clearance and you always have the grip you need. So that’s a really good tire. They are good on fast stretches and technical corners. I’d love to run them every race. What is your preferred gearing? When it’s really fast I go for a 46 chain ring [Eli runs a single chainring]. When it’s uphill or more mud, I choose a 42. Cassettes are standard 11 to 30. You are among the last professional racers who started their career on cantilever brakes and moved to disc brakes. What are your thoughts on using discs? In cyclocross I never want to use cantilever brakes anymore. The hydraulic brakes are so fast and respond so very good. On the tiniest push you give to the lever, it’s doing something. So you can really use it in the corners. If the corner is in 1.5 meters you can still brake before you get through the corner. But with the cantilever brake, you had to brake like 10 meters before. That was standard and everyone was doing it but with the disc brakes it’s really a new thing for every rider to use them at the right moment and maybe at the last moment possible. I don’t want to go back to the cantilevers. Also, in road racing I think we should use it. At the beginning, everybody was worried about weight of the disc brakes, but now we ride the new Dura Ace groupset and it’s almost the same. It’s working 100 percent better than the cantilever brakes. I think it’s the best change in cyclocross. I don’t know when they started doing carbon frames, but [disc brakes have] really changed the game. What’s your pre-race warm-up music? When I have to really focus and get race ready, then most of the time it’s something from AC/DC or that kind of stuff. Ha! That was a topic here in Belgium because I did the Kroonprinsen show on television and I was always eating chicken with rice and appelmoes [apple sauce] in the morning. They call me crazy but that’s the thing I eat always like three hours before the race. Outstanding. Thanks for the time and see you in Iowa. For more info on the Jingle Cross event and World Cup races, go to www.jinglecross2.com. To keep up with Eli follow him on Twitter at @iserbyteli and on Instagram at @iserbyteli . Follow Marlux-Napoleon Games at marlux-napoleongames.be/.